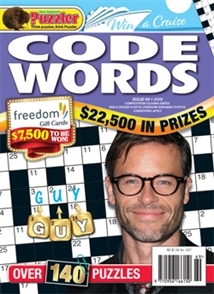 Code Words is bigger and better, with over 140 puzzles crammed between its covers. A standard 15x15 grid, with three starter letters, forms the basis of most puzzles, but others are given a celebrity twist or illustrated with amusing drawings. Whilst a straightforward puzzle challenge lies at the heart of the majority of the code word puzzles, others spice up the challenge by adhering to certain themes, or adopting different grid structures, such as Skeleton grids – where the reader has to ascertain the position of the black squares; Spirals; and even wordsearch grids, where the solutions can read in any direction. In addition to photo puzzles featuring amusing star quotes and facts, Code Words also offers the challenge of the mighty Q-Brute, a cross between an acrostic puzzle and a code word that's a true test of a reader's lexicological skills. Add great prize competitions in each issue, and whatever level of puzzle challenge you require, you'll find it within the covers of Code Words.